I am having a bit of an identity crisis this year. I have always identified as a cold weather lover, but you guys, this winter has been rough. Beyond rough. I have struggled so much with productivity the last 3 months. Like having to run one errand wiped me out for the whole day. Someday wearing matched socks was too much of a struggle. I may have to rethink my stance as a lover of winter. Which is why I am SO happy to be welcoming Spring. I think Spring will now be my BFF. The weather is in and out but the days that the sun is shining I feel like a new woman. Which is an amazing thing because with Spring comes a ton of events and holidays that really require my A-game. You might be aware that Easter is just days away and if you are like my family you are just getting around to the menu planning stages for Easter dinner/brunch. This year I’m in charge of deviled eggs (trying to decide between classic, herbed deviled eggs, smoked salmon deviled eggs, or nicoise deviled eggs – too many choices!) and hot potatoes. I was considering scalloped potatoes, but now am thinking of making a batch of my Roasted Garlic Herb Cream Cheese Mashed Potatoes. I’m a maker of last minute decisions. Anyway, after Easter we have A’s First Holy Communion (so happy for him!) that we will be hosting a small party afterward. Then we have Mother’s Day and Father’s Day all right in the middle of graduation season. This is a busy party time of year, right? Seriously, this dip is so creamy and delicious! It features my very favorite Challenge® Dairy butter and Challenge® Dairy cream cheese that has the creamiest, richest texture of any cream cheese that I know. I used it in my baked goat cheese with harissa a few weeks ago, too! I am definitely on a baked cheese kick which is never a bad thing. 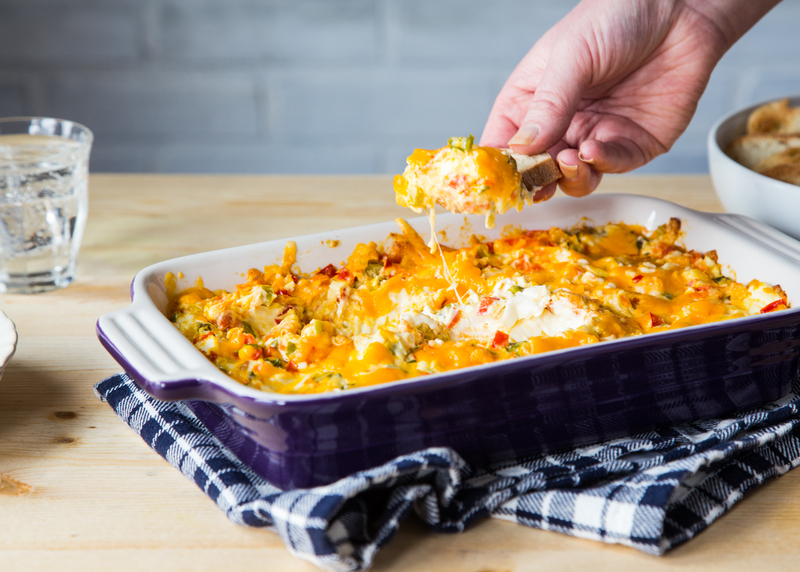 This Baked Vegetable Cheese Dip is a simple dip with a bases of creamy cream cheese, a touch of mayo, some shredded colby jack cheese for color and flavor, and lots and lots of sauteed Spring veggies! It’s Spring so let’s celebrate with produce, right? I used some asparagus, spring onions (or scallions), red bell pepper, and some shredded carrots. The veggies add texture, color, and flavor to this appetizer and it’s got all of the best qualities of vegetable cream cheese but with loads of veggies. I put together a little video (brushing off my video skills from my barren Winter video months) showing just how fabulously easy and amazing this little appetizer is! 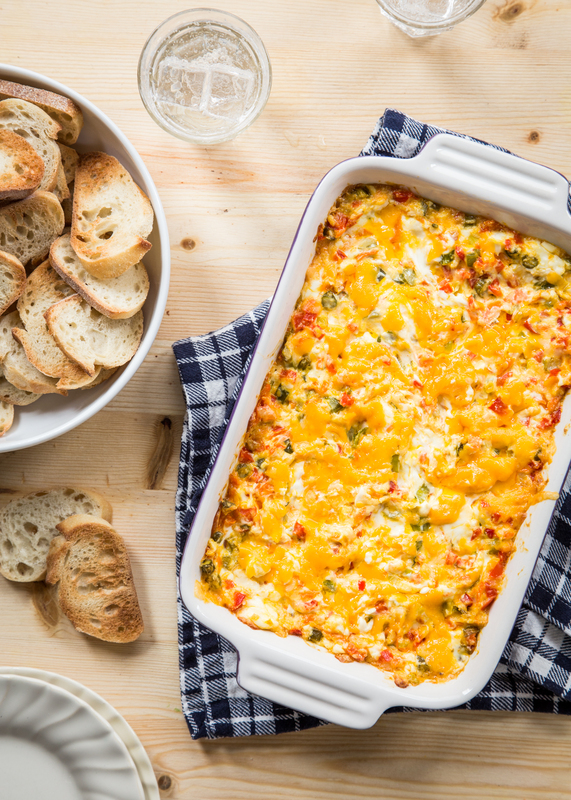 If you are put in charge of appetizers for any of your upcoming Spring parties, make this dip! 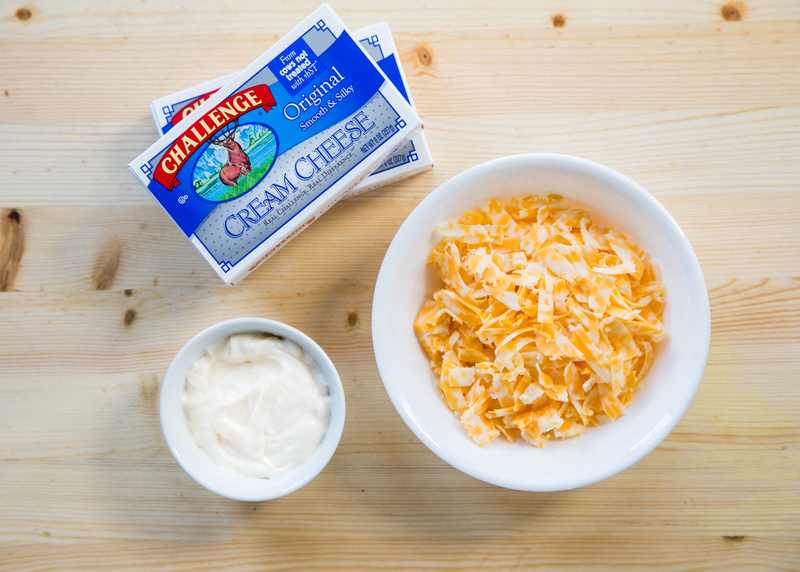 Also, if you see Challenge® Cream Cheese in your store do yourself a favor and pick up a couple of bricks! 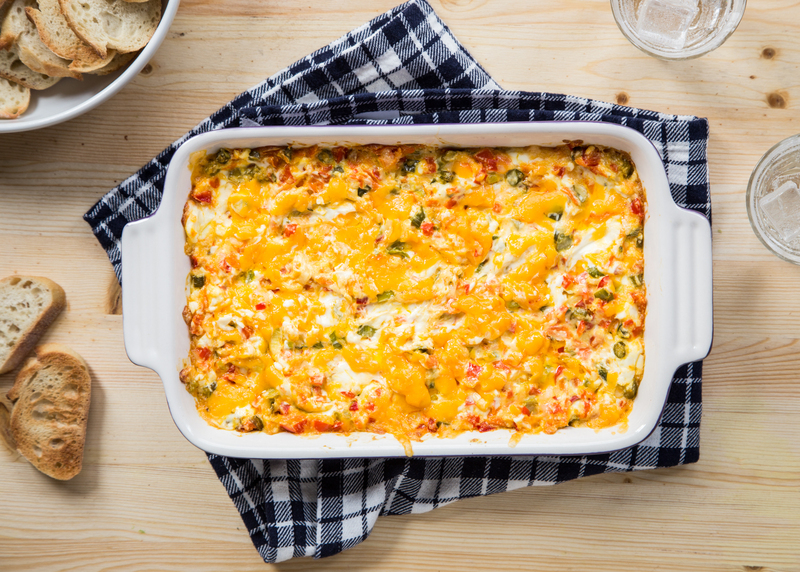 Spread it on bagels, use it in baking, and yes, make a batch of this Baked Vegetable Cheese Dip. You will be so happy that you tried it! Here’s to a new start this Spring, trying new things, and embracing every new day that we’re given! Melt butter in a medium sized skillet over medium high heat. 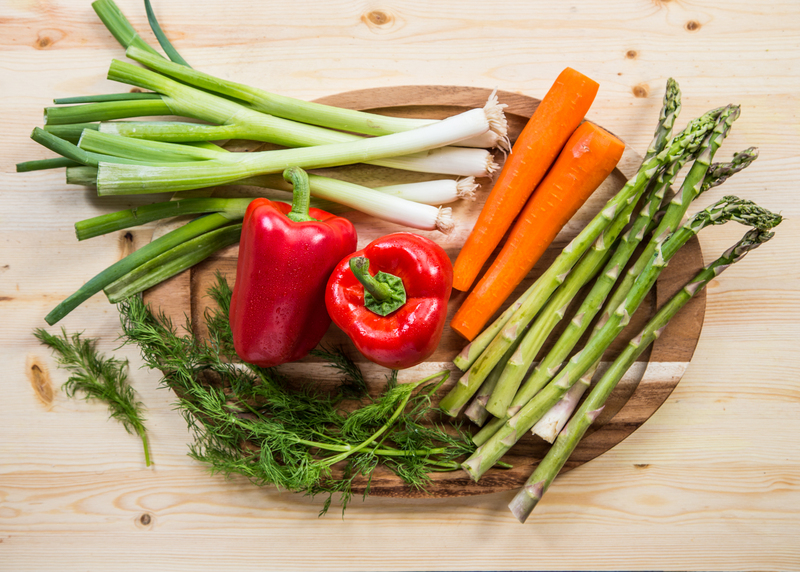 Add asparagus, carrots, bell pepper, scallions, a pinch of salt and cook, stirring occasionally until vegetables are tender, but still retain a bit of crunch. Remove from heat. In a large bowl, stir together cream cheese, lite mayonnaise, colby jack cheese, and cooked vegetables until evenly combined. Taste for seasoning and add salt if desired. 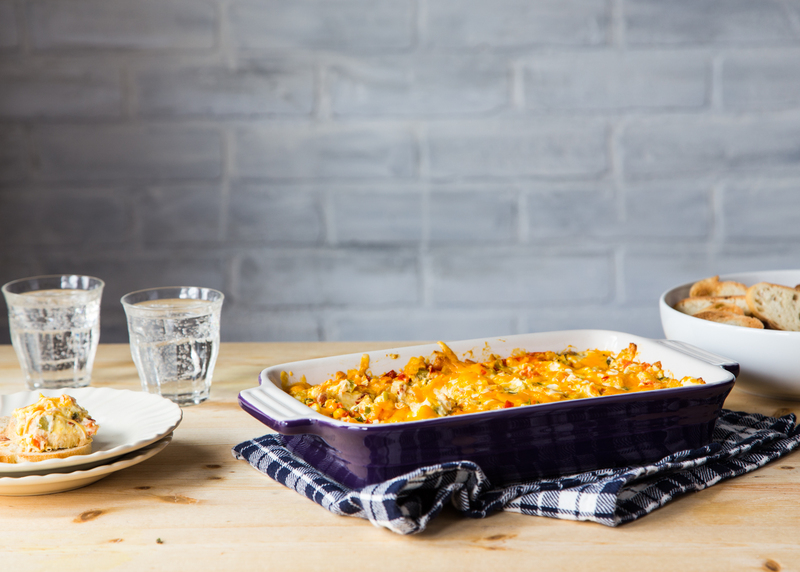 Spread cheese mixture in a small baking dish and bake for 25-30 minutes or until cheese dip is hot and bubbling. Serve dip with crackers or toasted pieces of baguette. Enjoy! I had no idea Challenge Dairy made cream cheese! I have to find it locally because their butter is the best EVER. I am definitely going to try out this dip. Also, I’m about to be the commenter I promised myself I NEVER would, but you might want to get some extra vitamin D. What you’re describing is exactly how I felt a few winters ago, only to find my vitamin D was really low. (no sunlight = much less D available, which is why winters get hard) Vitamin D helps with all sorts of important things like your immune system, bone density, sleep and such, so not having enough can have a big impact on your energy levels. Low Vitamin D is like wading through sludge, just so slow and tired and hard to get motivated, plus way more likely to get sick, which makes you feel even more tired and slow and hard to get motivated. 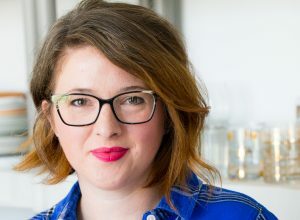 Emily, love this recipe as it not only looks delicious but it seems super simple! Great healthy dip idea for the spring and into summer!